Executives of large firms have been known to worry about social movement activity of three kinds. There are movements that encourage various kinds of costly state actions, such as cleaning up pollution or reducing carbon emission, which at some level will lead to taxation to cover the cost. There are movements that engage in boycotts and other actions to discourage firms from various cost-saving misbehaviors such as farming out production to nations with very loose labor and environmental protections. 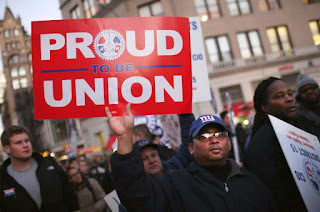 And inside the firm, labor movement advocates take action through established unions or through trying to form new unions where none yet exist. Responding to all this activity can exhaust executives, and they might not like to hear that these movements are related to each other. How they are related is the topic of an article in Administrative Science Quarterly by John-Paul Ferguson, Thomas Dudley, and Sarah Soule. They look at how social movements outside the firm but in the same city influence unionization drives inside the firm. This is interesting because social movements and unions operate very differently, with unions under much stricter rules and restrictions, so the influence is not a result of workers learning anything useful about unions by taking part in social movements. In fact, it is not even clear that they do take part in social movements, because the mechanism behind this effect requires only that workers can see social movements, not that they participate. Unions are built on procedures and ideas, with workers’ rights and equal opportunity among the most important ideas. It would make sense that the presence of similar progressive ideas in social movements in the same community could inspire union activity in firms, whereas social movements with more conservative ideology might have less effect on unionization because they have much less overlap with the ideology driving unionization. This is exactly what the authors found to be true in U.S. cities. Protests in a city led to unionization drives in the same city, and this effect was stronger when the protests were related to progressive causes, including civil rights and gender equality. So protests outside a firm filter into unionization inside, specifically when the outside protests concern issues that workers inside also care about. But there are additional details that make things even more interesting. Unions are not the only way for workers to solve problems. The Civil Rights movement and the women’s movement also had successes with changing the law, which meant that workers could contest gender or racial discrimination through the legal system rather than through unionizing. As a result, these movements’ effects on unionization were significantly reduced after the legal changes. So ideology matters, but competition from the law does as well. Protests outside create unions inside, except when there are laws outside that make unions less necessary. What does that mean for our situation now? The laws outside are being weakened, and protests are getting stronger. Could it be a time for more unions? Ferguson, John-Paul, Thomas Dudley, and Sarah A. Soule. 2017. "Osmotic Mobilization and Union Support during the Long Protest Wave, 1960–1995." Administrative Science Quarterly: 0001839217715618.